Enjoy live, personalized guitar lessons with Randy Vincent from anywhere in the World! Now, you can have live, one on one guitar lessons with Randy Vincent anywhere in the world using Skype. With Skype you can call Randy and get personalized instruction just as if you were in the room with him. The video conference allows you to see and hear Randy, chat with him, and have all the convenience of a personal home training session. 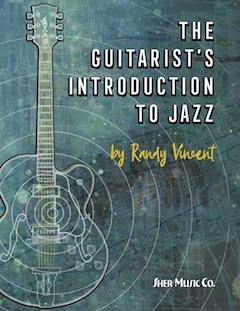 Randy has been teaching Studio Jazz Guitar at Sonoma State University since 1981. In addition, he teaches privately at his home in Santa Rosa, California. The private lessons are for students who have already been studying guitar and are more advanced. His approach is to spend about two hours exploring ideas and techniques that will enhance the musicianship of the student and will include theory as well as specific exercises. Each lesson is adapted to the needs of the individual student. The lessons are scheduled as the student feels he or she is ready for more. It may be as often as every week, or it may be as seldom as once a month. In any event the student determines how he or she wants to progress.